The Links below will take you to the facebook albums of our fabrics. You do not have to have a facebook account to view them. If you do, please LIKE our page! We update as often as possible. Not all items can be customized. how to measure your cat video click here! This album contains fleece, micofleece & mini fleece for SLINX, cat's pajamas and New Kitten Kits. You can enter using the above button, or click anywhere below on the album. PLEASE read the album intro below. Post by Simply Sphynx Cats and the SLINX. This album contains t shirt materials for the Kit-T-Shirt, the Retro Raglan, the Rugby and other Simply Sphynx produced customizable items. This also includes our Sunblock Jersey. WHAT IT CAN BE USED FOR--ie, fleece cannot make a jersey t shirt, and a jersy t shirt material cannot make a SLINX Sling or Fleece pajama. 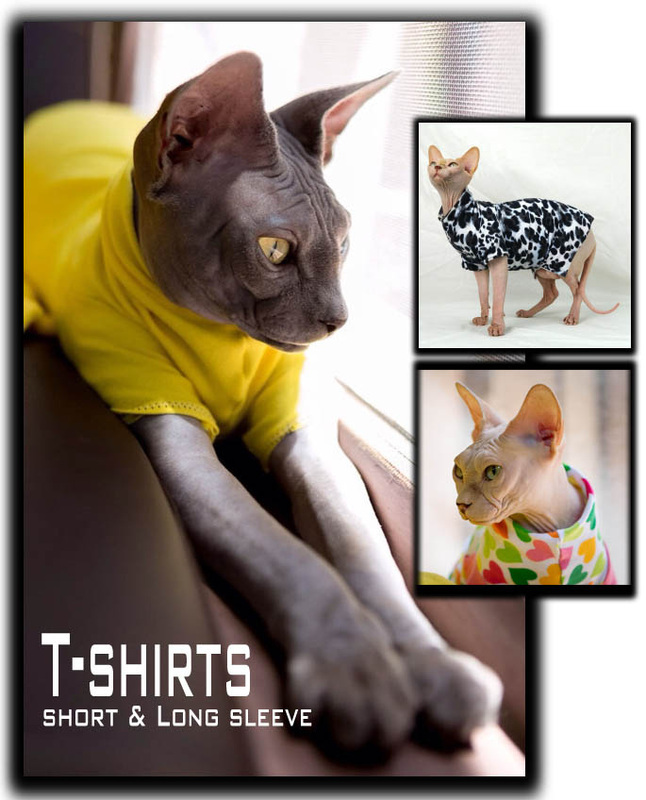 This is the album of all available FLEECE from Simply Sphynx and the INK DOG. I try to keep it updated every 48 to 72 hours. Please read below so you understand about fleece fabrics, their finishes and pattern scales. There is a ruler in the pictures so you can see the scale of the print. If you wish to choose or design your own SLINX, kit or clothing in Fleece, please send me a custom order request through etsy. MINI-FLEECE: Ultra soft and slightly absorbant, thinner and often used for childrens clothing. MICRO FLEECE: Very thin, almost medium t shirt weight with a soft feel to it. PLUSH FLEECE: Mid to light weight with a slightly "furry" feel, often called "Ultra Cuddle." Anti-Pill: A fleece that has been made more resistant to pilling on one side. Brushed Fleece: Not as lick-proof as anti-pill, but very soft. Please pay attention to the ruler in each picture, it is either a 12" or a 3.5 " ruler card. Once you have chosen your fleece, please message me or order within Etsy using the Descriptive Name from the photograph. This is the album of all available Jersey Knit, T shirt type material and specialty materials from Simply Sphynx and the INK DOG. I try to keep it updated every 48 to 72 hours. Please read below so you understand about jersey fabrics, their finishes, weights and pattern scales. If you wish to choose or design your own T shirt, kit or clothing in Jersey, please send me a custom order request through etsy. Jersey Knit: Jersey usually means it does NOT have to be hemmed, and has a four way stretch. It can have many different fiber contents. Lycra: The stretch component in most knits, usually making up from 5-15% of the fabric. Cotton: Ultra soft and with a slightly fuzzy texture, cotton is one of the most expensive fibers and makes up anywhere from 10-95% of a lot of jersey. Rayon: A thin, soft and drapey fiber made from bamboo. Rayon Jersey often has a slight sheen to it, and is used to make skirts and dresses with a very soft feel. Polyester: A man-made fiber, it makes up 100% if most fleece fabrics, and a portion of a lot of jersey fabrics. It's very strong, but cannot bear heat. 4 Way Stretch: Just what it sounds like, if you have a square of fabric and pull horizonatlly then vertically it will stretch in both directions, usually one more than the other. Most of my fabrics are 4 way stretch, while the designer I work with, Meli (Stella Oriens Designs) prefers 2 way stretch. 2 Way Stretch: fabric will stretch in one direction but not the other. Used for making slightly more structured garments such as tank tops and some shirts. Yarn Dyed: The actual Fibers of the fabric are colored before weaving, usually resulting on the pattern being on both sides. Printed: The pattern is printed on the fabric, usually a white fabric, after the fabric is woven. This usually results in the back of the fabric being white, no pattern showing through, unless the fabric printed on is already a different color. Jersey fabrics can be almost tissue thin to a heavy T shirt weight.